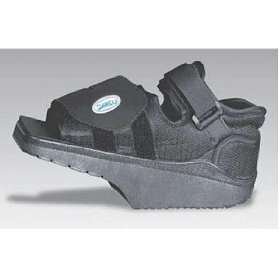 Large: Mens 10 1/2 - 12; Women's 13+ * Black * The DARCO OrthoWedge is clinically proven to reduce weight bearing pressure on the forefoot which promotes faster healing after surgery trauma or when forefoot wounds or ulcerations are present * 15 wedge sole effectively shifts body weight to the midfoot and heel. Reduces forefoot pressure by as much as 57%! * Square toe design acts as a bumper to protect the toes when k-wires are present and provides better left/right fit * Ankle strap seats foot firmly in shoe to reduce heel slippage and eliminate friction * Removable forefoot closure provides security while eliminating buckle pressure * Zoned outsole has an aggressive tread under the mid-foot where traction is needed most * Removable Insole features twice the padding of standard insoles and can be modified as needed. Insole can be totally removed to accommodate DARCOs innovative Peg Assist customizable off-loading insole * Optional Peg-Assist Insoles available: use 1471A-1471E * HCPCS Suggested Code: L3260 Average lead time for shipping: 9 + days.